Results for continuous sites are low-latency (~2 days), and presently are for hazards use only. 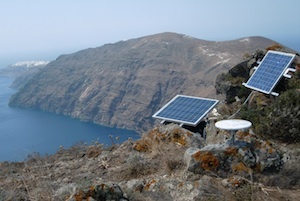 All data are collected by Georgia Tech and University of Patras equipment (yellow-GTUP), aided by UNAVCO, inc., and supported by Georgia Tech, The University of Patras, and the U.S. National Science Foundation. Additional stations installed by Oxford University and the National Technical University of Athens are also shown (green-NTOX). A single station operated by the National and Kapodistrian University of Athens (blue-NKUA). Processing includes final static PPP determinations using precision JPL-determined satellite orbits (green), and rapid-static PPP determinations using rapid JPL products (red). Station-dependent biases between final and rapid solutions are removed using the observed overlap in the last 2 weeks for which final solutions are determined. Detailed time series for all continuous GPS data is here. Movie of the ongoing changes in the deformation as observed by the continuous GPS is here. 3D visulaization of the deformation as observed by campaign and continuous GPS is here.